Set in the era of Prohibition, 91 Days tells a tale of revenge in a town called Lawless - the mafia controlled den of bootleggers and hitmen. Angelo Lagusa returns to Lawless under the alias of Avilio to repay the don who killed his family in this drama of subterfuge and vengeance. Angelo has witnessed his family killed as a child and was forced to run away to avoid the mafia killing him as well. After seven years in hiding, he receives a letter containing an old picture of his brother and addressed to his real name, warning him that the Vanetti family knows where he is. Fueled by revenge, he returns to the town of Lawless as Avilio Bruno, he seeks out childhood friend Corteo as he works toward his goal of retribution. 91 Days wraps up its mob epic in a spectacular way, providing enough closure to leave the viewer satisfied, but open enough to leave the possibilities open for the future and also feel too blunt or forced. This final episode handles its place in the series very well, bringing it full circle with throwbacks to previous scenes throughout the show and returning to a less dialogue and action-intensive style that relies more on the music and shot compositions. The last members of the Vanetti family meet their own ends struggling until they are cut down, but Nero and Avilio set out on a journey reminiscent of their first exile from Lawless. Through their journey, there isn’t much said, but it is easy to imagine the things running through Nero’s mind. “Is this all my fault for trusting him” - “Should I just kill him or will that leave me as dissatisfied as he is” - “He did this to make me understand how he felt all those years ago, will anything I do for revenge even matter to him?” Avilio goes along for the ride without resisting, in an almost dazed state reflecting the void he now feels inside himself. On their almost listless journey to the sea, the pair know how it has to end and yet neither of them have any particular problem with it or with taking their time to get to the conclusion. After they get to the beach, they take a walk with Nero in the lead. He pauses for a moment and Avilio goes on ahead, now leading Nero. A gunshot rings out and the waves wash away the footprints as Nero gets back to the car and drives off, a can of peaches sitting in the passenger seat. The small nods to things like that and the skillful setting of the mood on the trip make it a satisfying end to the long tale of revenge. In the end, there is no big battle for Avilio, no final fight, just the knowledge that he has accomplished what he set out to do, and that he is now left feeling hollow of spirit and meaning. In turn, Nero feels likewise, but without the same weight of years under the burden as Avilio felt. The sense of finality during the journey to the open waters and acceptance of fate in the closing of Avilio’s scheme set a somber mood that definitely reinforce the notion that revenge is empty. Even through all of the struggle, through all of the effort, the time, the risks, and the successes for Avilio in wreaking vengeance upon those who took everything from him, he come out of it with less than he previously had. The only friend he could ever turn to, dead. His conscience, weighed down with guilt. His hands covered in blood, and his life empty. In the end, he tried so hard and now he sees that none of it matters, so he accepts whatever fate comes to him without resistance. This poignant ending rounds out Avilio’s character, while also providing a great development of Nero as well. Altogether, 91 Days handled its characters and themes very well to deliver a thrilling and enjoyable show. Even though there were a few episodes that were mediocre, there were a great deal of them which were stellar, constantly one-upping the last in a succession that kept things interesting while maintaining some suspense and moving the plot forward. In one line: Avilio - Angelo’s - story is finally complete, wrapped up nicely enough to be satisfying in and of itself, yet leaving future possibilities open. Avilio is definitely feeling less than stellar after having killed his childhood friend, and pretty much the only person he could have any attachment to left in his life. From the bags under his eyes to his tone of voice and responses, it is easy to tell that he is feeling the weight of his actions (not to mention the hallucinations he sees throughout the episode). Though he does not have the expected wrathful, burning-flames-of-Hell motivation that it seemed he would have from last episode’s ending, the emptiness is better overall. It lets the viewer know that while yes, Avilio did pretty much consign his soul and humanity in order to take out his revenge, killing Corteo was traumatic enough make him human again. The haunted, “empty shell” that is left of Avilio holds the same ability to have his vengeance, but is more compelling in that he isn’t headstrong and prone to make mistakes because of haste. Characters that fight from a state of emptiness have a much more chilling and nuanced kind of determination than one fueled by straightforward “these things have happened and now I am angry and determined” situations, and Avilio has definitely hit the mark. Even when Barbero’s suspicions cause the plan to go awry, Avilio’s emptiness causes him to not be outraged or to act rashly, but to take everything without reacting, solemnly knowing that one way or another he will get his revenge one day. The way events unfold in this episode is not quite the same style of revenge as has happened previously (take Vanno, for example), but is more complex and greatly appreciated. Instead of moving to take all of the shots himself, Avilio uses the Galassias family to destroy everything that the Vanettis have built, making for a wonderful moment as Avilio stands before Vincente as the son of Testa Lagusa seeking vengeance. With Don Galassias assassinated, his nephew takes over and orders the annihilation of the Vannetis, taking Vincente’s dream away from him through the very ones he colluded with to take over many years ago and taking Nero’s family away just as he took Avilio’s. Though the Galassias thugs fighting with the Vanettis was reduced to a few brief shots of key characters which could have been elaborated on a bit more and been more interesting, the episode makes up for it with the screentime Vincente gets and his development as he nears the end of his life. One thing to definitely look forward to in the next episode is the highly-likely showdown between Avilio and Nero, which will probably end with both of them dying and the Galassias family coming out the victor in terms of controlling Lawless. The after credits scene didn’t give anything very solid to go on, but to go out with a big finish, it almost has to go the route of Strega Galassias offering Avilio an opportunity to do the dirty work as a gift for helping him take over the Galassias family. Overall, episode eleven was interesting and filled some of the holes left in the show, such as developing Avilio’s humanity, Vincente’s character, and having the Galassias family play a more direct role and show the power they have been rumored to have for so long. In one line: Avilio and Ganzo’s plan doesn’t go quite as agreed upon, but Avilio gets his revenge against the Vanettis through the Galassias family, setting up a final showdown between himself and Nero. A vast improvement from last week, episode 10 hits a nice, even pace that allows the viewers to enjoy the character and plot development setting up for a dramatic finish. Avilio takes Corteo to the apartment he lived in before returning to Lawless for safety until Avilio can complete his revenge against the Vanettis. Instead of staying there, however, Corteo receives a call from Ganzo telling him to return immediately in order to save Avilio. Avilio was not in dire need at the moment, but it was clear that he would be put on the spot almost immediately due to someone saying they saw Corteo at the dock the day Avilio left for Chicago. Barging in just as Barbero was questioning Avilio, Corteo sacrifices himself for his accomplice, his friend, his brother. As Barbero turns the inquisition to Corteo, trying to implicate Avilio for betrayal of Nero as well, Corteo craftily gives Avilio one last boost in saying that Barbero is just scared that Avilio will take his place as Nero’s right hand. Infuriated, Barbero moves to strike Corteo again, but Nero puts a stop to it, acts as if he is about to shoot Corteo, then decides to hand the gun over to Avilio to make him do it. Corteo meets his end this episode, but he was excellently developed. Even though he pretty much dropped off the face of the planet for a few episodes, his resurgence allowed for him to achieve great things plot-wise and in his own development. After being effectively on his own for two episodes, angry at Avilio and how he had sold his soul to get his revenge, he brings out the part of Avilio that still holds on to his past. Corteo returns to the brother figure that he was in the beginning, but now with the determination to save Avilio even if that means letting Avilio go through with this crazy mafia participation or giving his own life to protect Avilio. At the very end, Corteo gave everything he had to ensure Avilio achieve his goal - he cast doubt on Barbero’s ability to remain unbiased when regarding the Don’s decisions, he cleared Avilio’s name by being killed, and he gave Avilio the circumstance and motivation he needed to finish what he started. Now that Corteo is dead, Avilio has absolutely nothing left, nobody to use as leverage or a hinderance to his mission, and he is completely dedicated to realizing his vengeance because of what it has cost him. Avilio is now untethered and untouchable in regards to everything except his own life. Overall, this episode has done well in preparing the characters and the circumstances for a final showdown. In one line: With the reveal of the Vanetti playhouse coming soon, the setup for the big show begins. Coming off of three straight episodes that topped the previous as the best so far, episode 9 is the inevitable letdown. It was disappointing for many reasons besides its relation to its recent predecessors, foremost among which was the astounding drop in visual quality. On multiple occasions, the proportions or style were off for faces in particular as well as general body sizes/shapes. Avilio and Nero have some spectacularly derp-tastic moments, some of which make it difficult to discern who they are without having just seen the previous shot of them from a different angle with their normal face and body a few moments ago. The drastic and sudden drop in this aspect forces one to wonder if the studio was simply pressed for time and money or if the usual character animators are away from work for some reason. The first time or two is a bit annoying, but as the episode goes on, it becomes more and more distracting, breaking the viewer’s focus and immersion. Beyond the visual issues, the mood of the scenes was thrown off due to applying the pacing of the latest action-packed episodes to an episode that focused mainly on moving setpieces and revealing one of the largest mysteries of the show. The big reveal of who the fourth person at the murder of the Lagusa family, the writer of the letter, the man who is most likely using Angelo/Avilio to gain control of the Vanetti family is none other than Uncle Ganzo. Early in the episode, Corteo is being tortured on the Vanetti property because he endangered Nero’s life and killed Fango. He escapes and is eventually caught and held hostage by Ganzo, forced to call Avilio and tell him that if Nero is not dead in 24 hours his captor will kill him. Meanwhile, Vincente makes Nero the official Don Vanetti and everyone re-pledges their allegiance to him and the family. With this much planned for plot development, the episode could have been great. Some decisions to allocate time to needless transition scenes of a poorly-drawn Avilio walking down a path on the Vanetti grounds, amongst other similar things, led to all of the important suspense, moments, and reveals essentially having their knees taken out from under them. Though there was excellent music and vital progress made plot-wise, it all fell flat because it wasn’t given the proper amount of time (and visual appeal) to develop and feel natural. In one line: A drop in animation quality and the overwhelming successes of the past few weeks leave this episode feeling weak even though it had some big plot progression. After sidelining Corteo and his history with Avilio for so long, episode eight rectifies the situation and depicts how following his childhood friend’s lead has affected him. Starting off with Corteo overhearing Avilio quote his line about being brothers to Nero, the dismantling of Corteo’s original anti-mafia character who sells moonshine to save up for college hits a slippery slope. The new Prohibition officer, Mr. Delphy, makes his appearance in Lawless and claims that he will take down the mafia and their liquor. Nero, now acting as the ex officio family head due to Vincente’s illness and the events of episode 7, is undaunted by Delphy’s big splash and sends Avilio and Corteo to pay him off. Corteo is surprised when Avilio nonchalantly asks, “Your daughter is four years old now, correct?” making his meaning very clear to the new man in town, though Delphy turns down the money. With a nervous face, Corteo notes how Avilio has assimilated into the mafia so completely - Nero has even made him his right-hand man. The way Nero has come to so easily depend on Avilio unnerves Corteo since he knows Avilio’s plans and because Nero has more or less become a replacement for Corteo in Avilio’s life. Withdrawing to the one acquaintance he has, Corteo has a drink with Cerotto of the Fango family. Ground down by the turning of the mafia’s wheels, he acts similarly to Frate by drinking more, sleeping less, and looking to become dependent on someone else who can possibly grant them their desire. Turning coat and ratting the Vanetti’s information to Fango, Corteo hopes to bring back the Angelo he once knew before he was bent on revenge. After Avilio gives him money for college and tells him to stay out of Avilio’s life from now on, Corteo is overcome by anger and a sense of betrayal. Corteo continues to be worn away and broken down throughout the episode as nothing goes the way he would like and he detests the things that have happened since his friend returned to Lawless. The character development is excellently executed, pushing along an interesting and previously overlooked impact of Avilio’s actions. This newly distinguished facet in the writing is polished until it shines spectacularly at the end of the episode with Corteo completely unravelling. This striking scene that is the coalescence of all that has weighed on Corteo thus far makes for a third episode in a row which has been altogether exciting and extensively planned. Altogether, this week’s episode was an aria of sorts for Corteo’s loss of a friend and wonderfully handled his character development. In one line: After so much development for Nero and Avilio, the focus shifts to Corteo and his struggle through seeing how Angelo has changed. After having a great episode last week, 91 Days comes back to double down with another episode filled with great lines, drama, and scheming. Ronaldo’s pressure from the Galassias family takes on an overt role as he uses Frate to try to turn the Vanetti family into mere puppets. Frate has a great performance throughout the episode, and though it’s a tragic story for him, there was a lot of great development in this one episode. In previous episodes, he has only really shown up in passing, overshadowed by the rest of the story and his brother, which contributes to the success of Frate’s plight in this episode. The writing for this struggle between brothers is well done and keeps things from seeming too sudden or cheesey. Not only does the writing do well with the two brothers’ dynamic and power struggle, but it has Avilio do what he’s best at - conspire against Nero whilst using the results as motivation for Nero to follow whatever plan Avilio tells him. At this point Nero’s pretty much blind faith in Avilio is a moot point, as the duo have been together for a longer time and Nero has more accomplishments to point at and say “have I ever steered you wrong?” - but it could be getting close to Avilio finally slipping up on something and Nero losing some trust in him. Besides the pathos of the brotherly feud, the politics and drama aspect of the episode was good as well. This episode was just as satisfying to the mob family conflict need as last episode was, and managed to do it even more enjoyably. The craftiness and deception is thrilling to watch and take part in, especially now that Ronaldo has been killed. Though Fio will say it was Frate who shot him and Nero who avenged his murder (a clever way to ingratiate himself with the Galassias family, or at least keep them from wanting him killed), there is no way that the Galassias family is going to sit back and call things even. It would make sense for them to now become a more readily present force in Lawless, which will make things all the more exciting. Also, this episode knocked it out of the park with all the little details and one-liners, the best being Avilio telling Nero that he will “let [Nero] meet him soon.” The use of dramatic irony has played a large role in making this and last episode so great, and it should stick around considering the show’s premise is Avilio’s revenge and we’ve gotten to a point where he can freely manipulate things with him scheming. Creating excitement, developing characters and relationships, and slowly increasing the complexity of Avilio’s revenge, the writers have certainly been doing well with 91 Days. So well, that there are moments when it is easy to forget about the show’s premise being solely focused on Avilio’s quest for vengeance and to simply get lost in enjoying each little step along the journey. As always, the visuals, mood, and themes are all beautifully crafted with wonderful writing that sets up 91 Days to be a must-watch contender from this season. In one line: With major developments in family and personal relations, Avilio’s plot becomes more intricately woven and filled with excitement. Episode 6 really turns up the excitement as Nero and Avilio are forced to come up with a plan to kill Don Orco in order to buy their safety on the Island. Starting off with a meeting between the exiled Vinettis and Fango, the tension is palpable as Nero does his best to deal with a man who is the right kind of crazy to just up and kill you. Playing to Fango’s particular sense of humor, Nero gains the favor of Fango for long enough to let Avilio start setting a grand scheme into action the next morning. Pulling out all the stops, 91 Days has the main duo walk right into the Orcos’ restaurant - the same place where Don Orco just had a conversation with Frate regarding killing Nero and acquiring the distillery producing Nero’s “Lawless Heaven” liquor. All dressed up and ready to go, Nero and Avilio have lunch with Don Orco in a wonderful scene that captures the tension of the moment and the boldness of the characters needed for their plan to succeed. Later, in the Lodge, the heart of the plan is sprung into action in one of the most exciting scenes so far. The cunning and deceit are enjoyable to watch, as you can piece together just what exactly is going on as Avilio fires a pistol at Nero who falls down covered in blood and Don Orco’s trust is gained. The real twist comes at the end of the episode, however, when Fango takes over the Orco family - now the Fango family - and gives the family lieutenants a taste of their new (and old) boss to drive home his particular brand of crazy. Aside from the big events and all the excitement that comes along with them in this episode, there were many underlying factors that helped to build the overwhelming success of episode 6. The return of cinematic transitions and shots in greater number than they had been used previously helped to make the episode visually pleasing and supported the classic mob mood of the show. The dramatic irony in the conversation between Avilio and Nero on the rooftop about how Avilio’s performance was so well done - because Avilio really has been waiting for the moment when he will kill Nero for a long time. In the scenes in and around the Lodge, the uncertainty of Avilio’s actions is definitely capitalized on, as it is entirely possible that he could have just been using his “plan” to satisfy Fango as a cover to kill Nero and simultaneously gain the backing and trust of someone as powerful as Don Orco to help him kill Don Vanetti. Had Orco said that he was the one who sent Avilio the letter, who knows how Avilio would have acted, as his character is precariously set on the edge, always ready to do whatever it takes to fulfill his revenge. The writing of this episode reiterates that there are still many possibilities open for the story to progress and that whichever way it grows, it will feel natural and exciting while being well written. In one line: 91 Days uses all the action and scheming it stored up over the past two weeks to deliver an exciting and information-filled episode that is the best yet. Hearing that the Orcos and Vanettis are working towards a tentative truce, Nero and Avilio start to head back to Lawless, stopping by the Lodge first - Nero’s secret moonshine business. There it is revealed that Nero is not only the son of Don Vanetti, but could also stand up for himself were he to be more truly cut off from the family. Considering that his brother Frate ended up making a deal which included Nero’s dead body to secure the ceasefire, some independence of funds could prove to be the key factor in supporting Nero and his handful of loyal family members as they take refuge with Fango on the Island. With all of the turmoil going on regarding who is at odds with whom, 91 Days continues to make the relations and politics of the mafia an interesting factor in the show. Though there are some moments where things seem to work out just a little too well for some of the characters, most of the countermeasures put in place (such as Tigre’s hand gesture warning) are very believable. One aspect that has disappointed more than expected is the dynamic between Nero and Avilio - there is almost no real tension between them anymore. Avilio may well have his sights on getting close to the Don first, which is logical, but Nero seems to be taking Avilio in too close. Where did the suspicion go? Yes, Avilio and Nero have been together for a while out in the country living, drinking, and fighting together, but from a narrative standpoint, this relationship seems to be moving a bit too fast. One of the greater aspects of the show as a thriller is its suspense, but now it is not quite as complex as it once seemed, instead becoming almost fixated on building tension as a result of plot circumstances alone to the detriment of the characters’ relations. The situational tension is definitely very well done, as it invokes both the pressure of the overarching and invisible hand of the Galassias’ power and complicated fractures and alliances of members of each of the families. However, this could all still be attained while maintaining the tension between Avilio and Nero and still have many ways for Avilio to seek revenge against Don Vanetti. The cooperation, if you will, of Nero seems too good to be true, yet not quite suspicious enough to be labelled as Nero having ulterior motives. In one line: 91 Days puts on the pressure through its use of situational tension, but lets the suspense of the main interpersonal relationship slip. Coming off of an episode that built both short and long term tension, episode 4 is in some ways a letdown, yet still entertaining and continues to develop the main characters. With the last episode providing the great set-up of a tentative alliance between two men on the run and an ominous hitman, a seemingly shallow journey through the countryside filled the space. Avilio and Nero have some nice back-and-forth which conveys well what happens on road trips or anytime two people are stuck in close proximity, but Avilio tends to be the more taciturn of the pair due to his knowledge of what Nero has done. This reinforces Avilio’s character and affirms his quest for revenge, but the majority of the episode is spent with Avilio and Nero subtly growing closer - for survival in the face of a killer, for money to buy food and liquor, and in general humanity when watching or entertaining kids playing at the site they pick to rest at for the night. While there isn’t quite the level of dramaticism that might have been anticipated based on the ending of the previous episode, this type of break from the hard-press of revenge and plotting turns out to work decently well. ...but Nero claims that there were four men who took part in killing Avilio’s family that night. With these new developments in character and plot, things are leaving the plotted course of Avilio’s revenge and keeping future possibilities open for various different directions. In one line: Avilio and Nero’s magical mystery tour is a nice change of pace while still giving substantial development to the plot and the characters. Episode 3 feels very natural in the way it handles interpersonal matters, whether it is the tension between Avilio and Nero, the differing moods of the Orco and Vanetti family meetings, or Nero’s sadness at watching his own funeral and being exiled to the countryside. As Nero finds Vanno’s body but not Serpente’s where Avilio claims they killed each other, he becomes enraged yet manages to control himself, illustrating his middle-of-the-road personality in terms of preparedness as the Vanetti heir - he still holds too much connection to his brothers and desire to lash out for revenge, but can think on a larger scale and control his rage. Among many other instances of character development, those that Nero receives this episode are quite interesting, making him a better match to Avilio and building the tension between them in their tentative armistice. In addition to the development of individuals, episode 3 develops how viewers understand each of the families. The meeting of the Orcos is in a posh restaurant, in which everyone looks to the Don’s approval before touching their food (except for Fango, who is ever the reckless, violence-crazed man) while wearing nice suits. The Vanettis, on the other hand, meet in a simple room in their house around a table, wearing more casual attire, and each speaking their mind and giving input on how they see the current situation for the family. Where the Orcos seem more business-like and cold-natured, the Vanettis feel more tightly knit as a family and less stratified in their roles and power within the family. The episode ends with another cliffhanger-esque scene in which a phone call notifies a man that “there’s two of them. Finish them both,” referring to Avilio and Nero. The catch is that nobody outside of the Vanetti family should know that Nero is still alive, so a hit being put out by the Orcos is likely out of the question. However, Ronaldo - the nephew of Don Galassias - married into the family just last episode, and even though he had left the room when it was suggested to fake Nero’s death to avoid the Galassias family’s intervention to avoid an all-out Orco/Vanetti fight, he likely expected it to happen. Regardless of whether it ends up being a hit ordered by the Galassias family or the Orcos, it will either further assert the overarching power and control of the Galassias family in a more direct way than before or leave the question of how the Orcos knew where Nero was going, indicating a mole or traitor in the Vanetti family. In one line: Family matters are complicated, and Nero is declared dead and secretly sent to the countryside with Avilio to avoid the Galassias family stepping in on a potential Orco/Vanetti fight. Beginning in a car chase and action scene, episode 2 quickly grabs the viewers’ attention before revealing the show’s opening theme. If you’re one to swear by these opening themes, it seems as if we are in for a lot of mafia, violence, and Avilio, which is to be expected. Later at a wedding party, the Galassias family is introduced through a political marriage between families, repeatedly hinting at greater forces at work beyond the Vanettis and Orcos. It’s very promising to see the setup for a large scale starting already, especially when there has been no episode count released yet for 91 Days, leaving it open to the possibility of running multiple cours and creating a truly wonderful tale of revenge and the mafia. While a well orchestrated long-term payoff is possible, some of the pacing in this episode could prove worrisome. We learn that the letter sent to Avilio using his real name in episode 1 was from someone claiming to be the “friend of [Avilio’s] father,” and contained the names of the three people who came to his house on that fateful April night seven years ago. By the end of the episode, Avilio has already used this knowledge to scratch off one of the names - Vanno Clemente - through what could have been a cunning play, were it not for Avilio’s hastiness for revenge. Starting his revenge too early could go one of multiple ways for the story on the whole - it could mean that things burn quickly and 91 Days devolves into Avilio being on the run and escaping [situation of the week], it could be that this is a way to continue Avilio’s characterization of being quick-thinking but sometimes rash and that things will get more interesting and intricate as the show goes on, or it could mean that next episode the Vanetti’s are either too forgiving or too dense and are taken in by some BS lie Avilio makes up on the spot. Given the amount of building that the rest of the episode did, it will probably be the second option, as there are now a multitude of loose end to be used in weaving an intricate tapestry of vengeance. Fango’s escape leaves the Orco family’s response to the hit as a possibility, and also an opportunity for him to reinforce his character as the violence-crazed loose cannon. Serpente’s survival (which may have been made apparent when he falls forward without any exit wounds, though that isn’t a strong assumption since many anime do not show exit wounds where people are shot) may lead to an Orco retaliation or to him honoring his promises of cutting ties with Fango and the Orco family. The possibilities abound with so many variables, which plays well for 91 Days as a thriller, keeping things exciting. Many of the strengths of the first episode live on, such as the use of music (the wedding reception band, the opera playing in Don Vanetti’s office) and deepening characterization - especially the brief moment when Vanno begins to say the first person he killed, only to stop short because it was probably Avilio’s father or the former Don - while some did not make as strong an appearance, like the cinematic shots of the first episode. All in all, the second episode was a success for what it needed to do - provide enough action to hook a wider audience, pique the interest of those wanting to theorize about how the drama-thriller will unfold between the mafia families and Avilio’s agenda, and leave the viewers with an ending that appealed to both of the previous groups of people and made them want more. In one line: “The whole world’s gone mad.” And this is only the beginning. 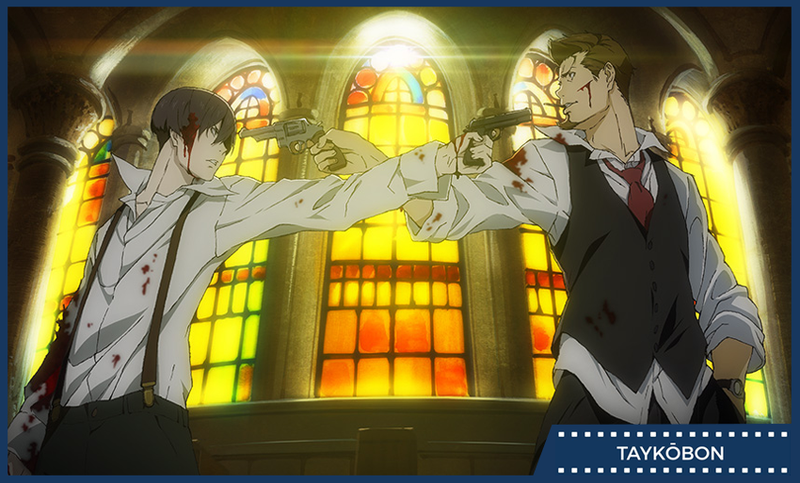 Opening with an ominous scene emphasized by the flash of lightning on Angelo’s murderous countenance, 91 Days delves into the events of 7 years ago, as a young Angelo plays with his brother and friend in his extravagant home. As the kids play with a candle, great subtle character development already begins to take place, marking Angelo’s friend Corteo as the brains who is somewhat hesitant to act and Angelo as the brave counterpoint, decisive and direct. Shortly thereafter, on this cold April night, some shady characters show up led by a man named Vincente who informs Angelo’s father that the don has been killed ... by him. Setting up the internal strife of mafia families, Vincente’s murder of Angelo’s family in his takeover of the family bodes well for a large-scale drama that is multi-layered, covering the mafia conflicts, Angelo’s personal revenge, and his relationship with Corteo. Hopefully the show will add more of the cinematic feeling from the beginning of the episode to those in the future, as it was an excellent way to create the perfect mood for a thriller or drama. Jumping ahead to the present, Corteo’s role as the planner and general “smart guy” is solidified as he says he is only moonshining to save money for school, as well as later getting the duo out of a bind in a speakeasy by causing a fire with a hot paraffin and water reaction to ignite alcohol. Angelo/Avilio still has his bravery, now fueled by a little bit of madness and revenge, as he comes to Corteo’s rescue from an Orco family enforcer, but shows his weakness in his rash decision to sell the alcohol to the family for his own personal reasons. In the end, he ends up saving two Vanetti men, one of them the don’s son Nero - the son of the man that killed his family. The nuanced characterization of Avilio and Corteo is one of the most exciting things so far and should lead to a well put together work, whether it ends up leaning more toward drama or thriller. The drama to unfold surrounding Avilio’s quest for revenge against the Vanetti family shows great promise of being well thought out and not being exceedingly blunt with its handling of what could be an epic of 91 days filled with scheming and turmoil. One of the episode’s main strengths lies in the mood created by the music and nods to classic cinematography, which will hopefully continue to support the show in the future. In one line: After seeing Avilio’s childhood trauma, we follow him as he returns to Lawless to get back into the mafia life for revenge. 91 Days is produced by Shuka and airing during the summer 2016 anime season. The original anime is directed by Hiro Kaburaki (Kimi ni Todoke, Usagi Drop) and has art direction by Hiromasa Ogura (Ghost in the Shell, FLCL, xxxHolic).